Front Porch residents using Eversound system for better hearing in group settings. It’s well known that untreated hearing loss has emotional and social consequences, such as isolation and depression, especially among older adults. The not-for-profit Front Porch Center for Innovation and Wellbeing is always looking for new ways to help seniors living in Front Porch’s residential communities. They launched the Hearables for All project to see how wearable hearing devices could help their aging clients, especially those with the all-too-common problem of not being able to hear in group settings because of background noise. To help fund this initiative, the center received a grant from the Consumer Technology Association Foundation to explore the next generation of wearable hearing devices. Hearables for All uses a group listening system designed by Eversound to combat the problem of hearing loss as it affects multiple participants during group events. This project also explores the effectiveness of smartphone-controlled Personal Sound Amplification Products (PSAPs), which enhance listening through wireless earbuds. HealthCentral wanted to dig into how this technology is working so far. Davis Park, director of the Front Porch Center for Innovation and Wellbeing, agreed to answer our questions by email. 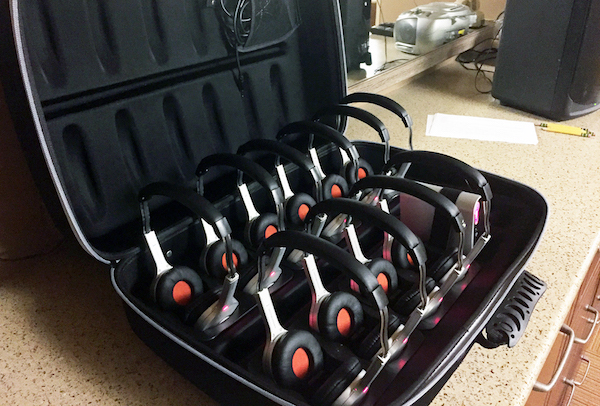 Eversound Caption: Eversound system ready to be deployed. HealthCentral (HC): Davis, could you please explain what hearables are and what Hearables for All is about? Davis Park: Hearables, an emerging term that’s a take on wearables, generally describes tech-enabled devices that can fit in or over an ear and that can be worn to enhance or improve a hearing experience. These devices are typically tethered to or controlled through a smartphone, which provides greater customization control based on a user’s unique hearing ability. Through Hearables for All, we’re exploring two types of listening technologies that we’re interested in trying out with our communities. The first is a portable, group-based listening system for events and activities such as meetings. The second is PSAPs that support the personalized listening experience for individuals who may benefit from sound filtering and amplification. HC: The biggest complaint about even the most modern hearing aids is that using them in group settings or when there’s loud background noise is stressful, if not impossible. Apparently, Hearables for All aims to solve this problem. How does it work? DP: The Hearables for All project, through its exploration of different PSAP solutions, is investigating the effectiveness of hearables in busy and loud public environments such as dining rooms and restaurants, as well as in personal and intimate listening environments like movie theaters. Because PSAPs are often controlled through a smartphone, a person can apply different sound filters to shut out white noise, amplify conversations, or increase certain sound frequencies to make hearing them more comfortable. The ability of these devices to control the hearing experience varies widely. We’re interested in looking at how they perform under the many different applications that our residents will be using them for. HC: The system that you are using in your Front Porch group settings is by Eversound. Will this technology eventually become viable for other groups? DP: The Eversound system is already commercially available, and has been installed in hundreds of senior-living communities throughout the country. Grant funding by the Consumer Technology Association Foundation has enabled Front Porch to purchase 10 systems for our communities. HC: Where do you see this technology going? Could someone with a smartphone ever use it, say, in a restaurant while eating with family, or is it solely designed for assisted living or nursing-home groups? DP: Hearing technology is only going to improve over time. Innovations in group listening such as Eversound and in PSAPs are meeting an important need among individuals experiencing hearing loss, especially as we age. But hearables are disrupting the listening-device industry in three important ways that challenge traditional hearing aids: They’re more affordable, they’re more accessible, and they’re simply more fashionable. Not unlike being handed 3D glasses before walking into a movie theater, we may someday soon be able to walk into a noisy restaurant and be offered a hearable device to enable us to have a more pleasurable conversation over dinner with our companions. These devices provide empowerment opportunities for us to stay independent and socially engaged and connected with each other. HC: What other technology do you see Front Porch using to help elders better connect with the world? DP: We’re excited about voice-activated assistants and the Internet of Things, and their potential to support the independence and well-being of older adults. HC: What, to you, is the most personally gratifying part of employing this technology? Do you have a favorite example? DP: The most gratifying part of seeing these technologies unfold in the lives of our communities is the unintended consequences and pleasant surprises we learn from our residents’ stories. We were moved, for example, when one of our residents exclaimed that she can no longer live without her Amazon Echo device and smart-enabled lamp because the technology now lights her path to the restroom in the middle of the night. Her technology is allowing her, like so many of her neighbors, to continue to live independently and with dignity. HC: I know several people with hearing issues, so this new technology excites me. I’ve also been involved in different living arrangements with my elders and I can see how much it could have meant to several of them to have many of these devices. Thank you so much, Davis, for updating us on what looks like an exciting new future.